Gardens and Trains are the feature of this post. The next two issues of our series on the scenic stamp issues of New Zealand. There are some amazing gardens in parks throughout the country. Every town and city seems to have them. Some are large parks covering many hectares while others are tiny gardens tucked away in some unused corner. All have their own beauty and individual identity, being enjoyed by many visitors each year. 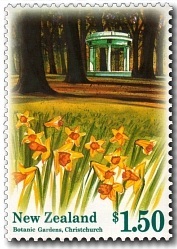 The 1996 Scenic Issue features five of these more well-known parks. There is something about travelling by train. Its different to flying, more in contact with the surrounding scenery. New Zealand has some great trains, an attraction to both overseas visitors and locals a like. I've only travelled on two of these, the trans-alpine between Christchurch & Greymouth and the North Island Main-trunk between Auckland & Wellington. This issue features six of them, some still running today and some discontinued. 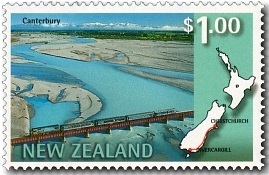 What I like about these stamps is that they don't just show trains, but rather trains in scenery of New Zealand. 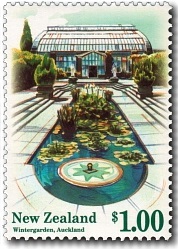 1996 Scenic Parks and Botanic Gardens. 40c - Seymour Square / Blenheim. Seymour Square is just that - a perfectly square flat hectare of garden. It is named after a district pioneer who set aside the land for a park in 1857. Cricket and rugby were played on the ground before its garden development began in the early 1900s. A fountain and high imposing clock tower, both war memorials are dominant features. 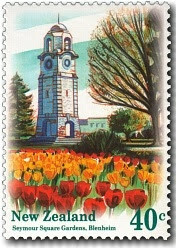 The tower, clad in stone from local river beds, was unveiled in 1928 to remember Marlborough's World War I dead. The fountain, unveiled in 1953, commemorates those killed in World War II. Stately trees, many planted to mark district events, also grace the garden. Formal flower beds are planted twice a year for summer and winter displays. 80c - Pukekura Park / New Plymouth. Pukekura Park is named after the stream flowing through it. Originally the park was a barren swampy valley. Today it's a magical place, full of contrast and character - dense native bush, walkways, bird life, native and exotic tree collections, lush fern gullies, colourful hidden dells, broad sweeping lawns, formal flower beds and freshwater lakes and streams. It's also home to one of New Zealand's most picturesque cricket grounds with a strip good enough to host international cricket. Pukekura Park and the adjoining Brooklands cover 49 hectares. 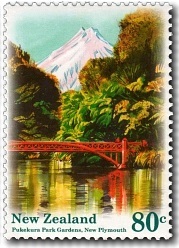 The view looking across the lake to Poet's Bridge with Mount Taranaki in the background is famous. I recognised that view as soon as I saw this stamp. $1.00 - Wintergardens / Auckland. The Wintergardens are an impressive element of the Domain, an 86-hectare green oasis near the heart of Auckland city. The Domain had its beginnings more than 150 years ago when Governor George Grey set aside 43 hectares for the development of a park. Later, the area of the park was doubled. Profits from the great Industrial Agricultural and Mining Exhibition, staged in the Domain in 1913, provided funds for the erection of the temperate house as the first stage of the Wintergardens. The project was completed with the addition of a complementary tropical house in 1929. The towering twins are joined by a formal courtyard with pools, statuary and arbours draped with wisteria. $1.50 - Botanic Gardens / Christchurch. 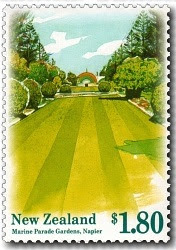 Hagley Park, with the Botanic Gardens at its heart, is the largest single city park in New Zealand. It was named after the Staffordshire county seat of Lord Lyttelton, chairman of the Canterbury Association. The Botanic Gardens date back to 1863 when the first tree, an oak, was planted to celebrate a royal marriage. Today, the gardens spread over 30 hectares within a loop of the Avon River. They contain the finest collection of exotic and indigenous plants in New Zealand with majestic trees, many more than 100 years old, forming an impressive background to the various garden sections. There is something for everyone - herbaceous borders, herb garden, rose garden, primal garden, heather garden, rock garden, water garden, rhododendron collections, the Cockayne Memorial Garden (New Zealand plants, shrubs and trees) and more. Thirty thousand annuals are planted each year for spring and summer displays. $1.80 - Marine Parade Gardens / Napier. The ocean of Hawke's Bay provides a close, dramatic backdrop to the gardens on Napier's Marine Parade. They are right on the waterfront, behind the concrete wall which was built originally in 1889 to protect the town from flooding in severe storms. The gardens stretch along the parade with manicured lawns, formal flower beds and trees all linked by walkways. The Sunken Garden, with a floating sculpture in a pool, was completed in 1969. Other features too add to their charm. A fine sundial, the Sound Shell and the Tom Parker illuminated fountain. The bronze statue of "Pania of the Reef" was unveiled in 1954, a floral clock was installed a year later, Marineland was opened in 1965, the Kiwi House in 1971 and New Zealand's largest aquarium in 1976. See our post 1958 & 1998 Pania of the Reef. 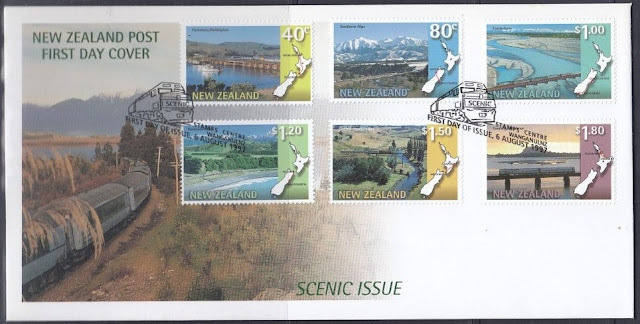 1996 Scenic Issue First Day Cover. What better way to enjoy the scenic beauty of New Zealand than by the comfort of a train. The Scenic Issue of 1997 features six of the tourist trains through some of the most spectacular scenery. Increasingly, passenger trains are becoming tourist trains with New Zealanders and international visitors alike travelling to enjoy the train experience and spectacular scenery. Tranz Rail's network is a major engineering feat, having been carved through magnificent mountain ranges and towering forests, across vast rivers and lush farmland, along precipitous mountain and coastal ledges and over steep ravines and gorges. What's more, construction of the railway took place over a century ago with the first main trunk line being completed between Christchurch and Invercargill in 1879. Used examples of the stamps of this issue. 40c - The Overlander / Paremata Wellington. In 1991 The Overlander replaced the Silver Fern Railcar with a locomotive pulled express. The train traveled the main trunk line through the heart of the North Island to link New Zealand's largest city, Auckland, and the capital city, Wellington. During the 681 kilometre journey, the train crossed 352 bridges and travels through 14 tunnels. Over the years the train sometimes ran a daily service or ran days per week according to demand. At its peak around 2008/09 the service had reached its full capacity with almost all of its 160 seats taken each day but by 2011 numbers had began to decline again. In 2012 The Overlander was replaced by the Northern Explorer, a new service with up-graded rolling stock. 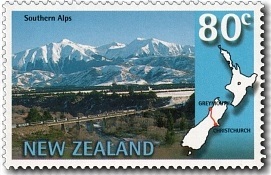 80c - The TranzAlpine / Southern Alps. The most popular and 'flagship' passenger train of the Tranz Scenic fleet is The TranzAlpine, the which does a daily return journey across the South Island between Christchurch in the east and Greymouth in the west. During the 231 kilometre journey, The TranzAlpine crosses the Canterbury Plains, winds up through the Waimakariri Gorge and spans many spectacular viaducts and bridges as it traverses the Southern Alps. Once through the 8.5 kilometre long Otira Tunnel the train travels through lush West Coast beech forests before reaching Greymouth. The TranzAlpine is particularly popular with tourists who will often have lunch in Greymouth before returning to Christchurch on the afternoon return service. Over the years the train has used a number of different consists and rolling stock but it is still as popular today in 2016 as it always has been. $1.00 - The Southerner / Canterbury. The Southerner train linked the main southern cities of Christchurch, Dunedin and Invercargill. The 589 kilometre journey is steeped in history as the route has the longest heritage of any passenger train. Crossing the great southern plains of Canterbury and Southland or hugging the coastline along the Pacific Ocean, The Southerner offered plenty of scenic variety. The Southerner followed the Main Trunk Line south from Christchurch and was one of the last passenger services to be hauled by steam locomotives. Various consists were tried over the years but the Southerner was never as popular as the other two South Island long distance trains. By 2001 the service had declined to 30 - 40 passengers per day, roughly half of what was required to make the train pay, so after attempts were made to save the train, it was discontinued in 2002. Today there are no passenger trains running on this route. 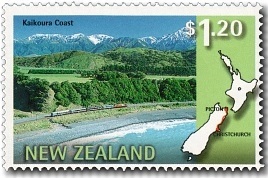 $1.20 - The Coastal Pacific / Kaikoura Coast. The 341 kilometre journey from Picton to Christchurch on The Coastal Pacific is an adventure between mountain and sea. The Coastal Pacific earns its name by tracking along a thin ledge of land pinned between the Pacific Ocean and rugged Kaikoura ranges. Winding through seaside tunnels and across snow fed rivers, this part of the journey is spectacular. This train replaced other railcars and expresses which ran this same route. In 1987 it was decided to up-grade this service to target the tourist market by providing similar rolling stock to the successful Tranz Alpine Express. This new train was known as the Coastal Pacific and it is an important link between Christchurch and the Cook Strait Rail Ferry. Over the years it ran in a variety of configurations including the Connoisseur car, backpacker's car and the Lynx Express. The train is still running as of June 2016. 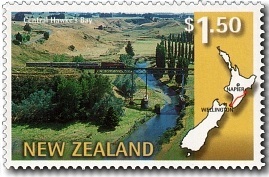 $1.50 - The Bay Express / Central Hawke's Bay. Overcoming the rugged Ruahine and Tararua ranges between the Manawatu and Hawke's Bay was the key to establishing the Wellington - Napier railway, now served by The Bay Express. The 318 kilometre trip from Wellington to Napier is a journey through the rural heartland of New Zealand. The Bay Express was preceded by the Endeavour which ran the same route from 1972 -1989. The timetable for the ‘Express’ had an 8am departure from Wellington, reaching Napier at 1.30pm. The return service departed Napier at 2.30pm and arrived in Wellington at 8pm. At first this service was well received by the public but being able to attract significant tourist traffic, by 2001 app. 45 passengers were using the train. This was considered too unprofitable so it was decided the service should be discontinued. 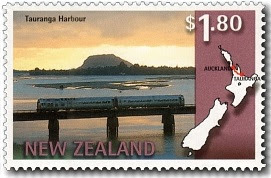 $1.80 - The Kaimai Express / Tauranga Harbour. The Kaimai Express links Auckland and the booming coastal city of Tauranga, gateway to the beaches and many attractions of the the Bay of Plenty. On its 231 kilometre journey, the train passes the Whangamarino wetlands, home to some of New Zealand's rare birds and plant life. This protected conservation area is classified by the World Heritage Trust because of its special significance. The Kaimai Express then crosses the Waikato River and travels through New Zealand's longest tunnel (8.9 kms) under the forest-clad Kaimai ranges. In 1991, the Silver Ferns that had operated the daily service between Wellington and Auckland were replaced by the locomotive-hauled Overlander, making them available for the Geyserland Express to Rotorua and the Kaimai Express to Tauranga. The southbound service of the Kaimai Express departed Auckland at 8:20am and reached Tauranga 3 hours 31 minutes later at 11:51am. The northbound service left Tauranga at 1:05pm and reached Auckland at 4:34pm, 3 hours 29 minutes later. The Kaimai Express did not make a profit, and in 2001 it was announced that the service was too uneconomic for Tranz Rail to continue. 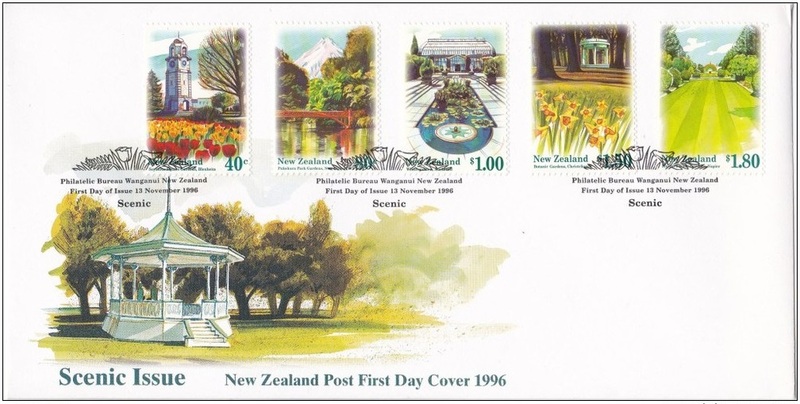 1997 Scenic Issue First Day Cover. 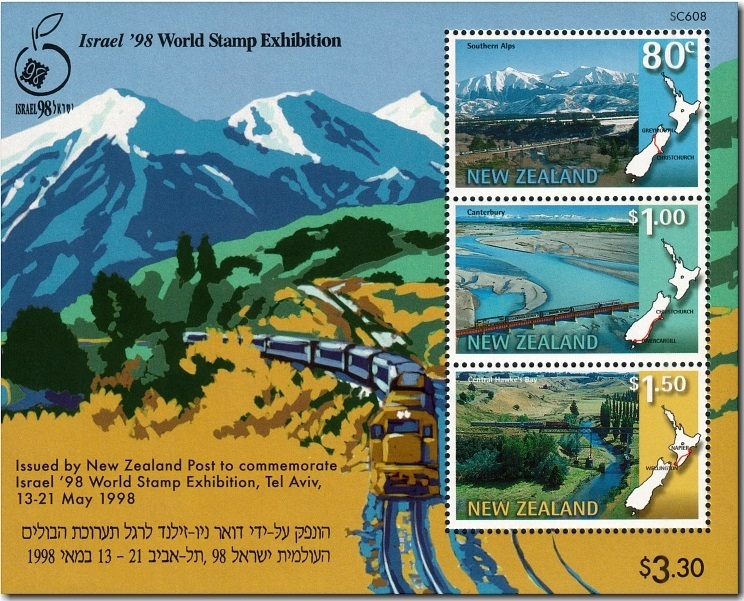 The Israel'98 World Stamp Exhibition was held in Tel Aviv between 31 and 21 May 1998 as part of Israel's 50th anniversary celebrations. The exhibition, held under the patronage of the international philatelic Federation (FIP), commemorated the issue of the Doar Ivri stamps, the first official issue of the then new Israeli state. New Zealand Post attended the Israel'98 World Stamp Exhibition and issued a miniature sheet incorporating three of the 1997 Scenic Trains stamps.